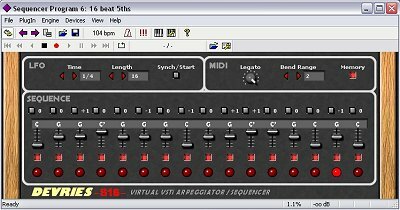 All tunes are created with VSTi virtual analogue synthesizers, which are either played by hand via a midi keyboard, or using a simple 16 beat sequencer. To create my compositions I use virtual recording and a midi sequencing software. The Mentor is a fairly simple synth, but surprisingly versatile, and very easy to set up and use. Only two oscillators, and one LFO, but the LFO is extremely versatile and together with the VCO2 synch the effects that can be achieved are out of this world. In addition to the filter, there is a Clipper which clips the waveform, and increases its amplitude. The effect is quite hefty. 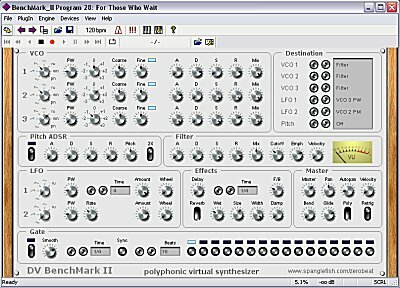 This VSTi synth can be downloaded directly form this website by clicking here. Please note that you would need a VST host programme to be able to play this instrument. A free VST host programme can be downloaded here. This little instrument makes a lot more sound than you would expect at first. It is a very basic three stage FM synthesizer, but with truly amazing sound (check MP3 sample on my Music page). The principle behind this instrument is that of one oscillator (carrier) the phase is modulated by another oscillator (modulator). You can offset the frequency of the modulator or the amount of modulation (via an ADSR) to very dramatic effect. This instrument has a second modulator which modulates the the first one to further increase the effects. There is also a simple triggered LFO and Delay. This VST plugin can now be donwloaded here. Please note that you will need a VST Host programme to be able to play this instrument. Download one for free here. The very latest addition to the set of instruments I use, replacing the BenchMark and using a complete new look. This is truly hyperversatile instrument a incorporating three VCOs and two LFOs, one of which is tiggered by the VST bpm clock. Each VCO has its own ADSR so it is possible to create the most amazing effects. There is also a very easy to use patch panel, wich allows the user to route the signals from all three VCOs, both LFOs and even the keyboard pitch to various parts and controls of the synth. Other features includes a delay, filter, glide and reverb. A simple built in gate function when used with the LFO allows for remarkable complex rithm effects. You can now download this VST instrument for free by clicking here. You will need a VST host programme to be able to use it. A free VST host programme can be downloaded here. 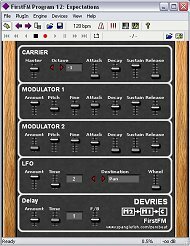 I have recently created an expirimental precussion synth, which I have given the working title Kraftwerk D.
This expirimental VSTi has six 16 beat sequencers built in, each controlling a combination of one oscillator and one noise generator. each of them with their own ADSRs. The pitch of the oscillator, which produces a sine, can be adjusted and there is a filter for each noise generator too. Finally, there is an LFO, which is synched with the BPM clock and can be used to automate the pitch of the oscillators individually, or the pitch or resonance of the filters of each of the tone generators. The volume of each individual beat can be adjusted too. I am hoping to have a more refined and updated version of this instrument sometime soon and make it available for download. Not a standalone synthesizer, but a MIDI arpeggiator/step sequencer. By linking this device between your keyboard and your VST instrument, you can automatically generate arpeggios of 1 to 16 beats (adjustable). A gate function allows you to skip beats for additional effects. The module operates in mono mode only. This VST plugin can now be donwloaded here. Please note that this plugin needs to be used in conjunction with VSTi's. The MIDI OUT of this dll must be connected to the MIDI IN of your VSTi. 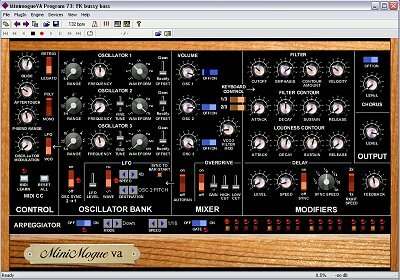 The MiniMogue VA is an excellent softsynth that I have used a lot in my compositions. It is quite strongly inspired by Moog Music's Mini Moog V. It has 3 oscillators, one of which doubles as a noise generator or LFO, a filter with contour settings, loudness contour, overdrive, delay and chorus. In Addition to the original Mini Moog, the VA also has an arpeggiator and gate funtion, which is used to create a lot of the rhythms. However, this facility is very limited, so I now use the DEVRIES S16 for it's greater flexibility. 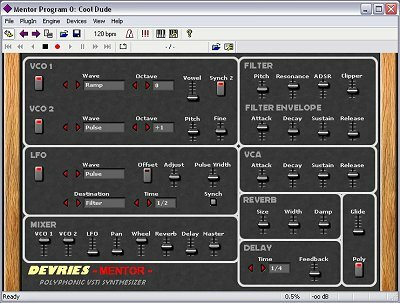 This softsynth was developed by Glen Stegner. This instrument can be downloaded for free here.